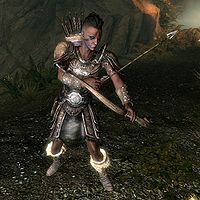 Eriana, a Redguard bandit, is one of the hunters who shows up in Bloated Man's Grotto hunting Sinding. If you choose to side with Sinding, you will have to kill her. Eriana wears a set of leather armor along with hide bracers and a matching pair of boots. For close ranged combat, she relies on a leveled sword that can be up to Elven in quality and a leveled shield that can be up to steel in quality. For long ranged combat, she relies on a leveled bow and twenty arrows, both of which can be up to Elven in quality. This page was last modified on 1 July 2013, at 17:42.